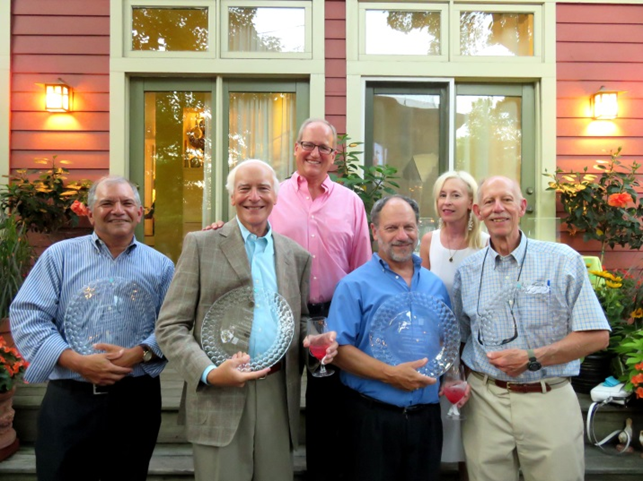 Community Servings Present the 2015 Lifesaver Award to Ed Hershfield, Carl Axelrod, Philip Schneider and Brown Rudnick. Since 1995, Brown Rudnick has provided pro bono representation to Community Servings, a renowned Boston organization, cooks and delivers healthy meals to those unable to leave their homes due to serious illness (such as AIDS). The firm’s work has been primarily in the area of real estate and labor negotiations, with 81 timekeepers devoting 2200 hours (valued at over $1 million.) In recognition of the firm’s outstanding support, at Community Serving’s 25th anniversary party, the non-profit awarded its 2015 Lifesaver Award to the Firm along with Brown Rudnick Partner Edward Hershfield and retired Partners Carl Axelrod and Philip Schneider. "I am writing to you to thank you for your help in getting us hooked up with pro-bono legal services. For six months we have been working with Steven Levine and his team at Brown Rudnick. With their help we have officially re-organized as new non-profit organization. …. We have a new mission which, although similar to our last, includes serving homeless children and their families on the north shore. ... Our shared vision is to house 5-7 homeless families currently living in motels. Along with clinical treatment we will provide them with life skills, education and the support of a caring community of volunteers. We are in the process of buying a new house. We have received the green light from the Department of Housing to receive expansion money and our support is growing day by day. Each Spring at his "State of the Firm" address, Brown Rudnick CEO Joseph Ryan presents the Brown Rudnick Center for the Public Interest M. Robert Dushman Pro Bono and Community Service Awards. These two awards honor both a successful Brown Rudnick attorney and a non-attorney whose professional or work life has demonstrated the qualities and commitment to the public interest that distinguished the firm’s late partner, M. Robert Dushman. As part of this honor, awardees earn the right to direct the firm to make a $2,500 donation to the reputable charity of the recipients’ choice. The Pro Bono Award was presented to Douglas A. Cohen, a partner in Brown Rudnick’s Hartford office. During his tenure at the firm, Cohen has devoted nearly 2,000 hours to pro bono engagements. His pro bono work has included serving as counsel to the Colonial Theatre restoration project, which has revitalized a critical decaying area in Hartford. He has been a Hartford pro bono leader, championing everything from legal clinics for the homeless to an innovative suit against the state of Connecticut in an attempt to gain broader dental care for the poor. Cohen has also served as a Director of the Brown Rudnick Charitable Foundation since 2007, serving several terms as Secretary, and as a very active member of the Foundation's Grants Committee.